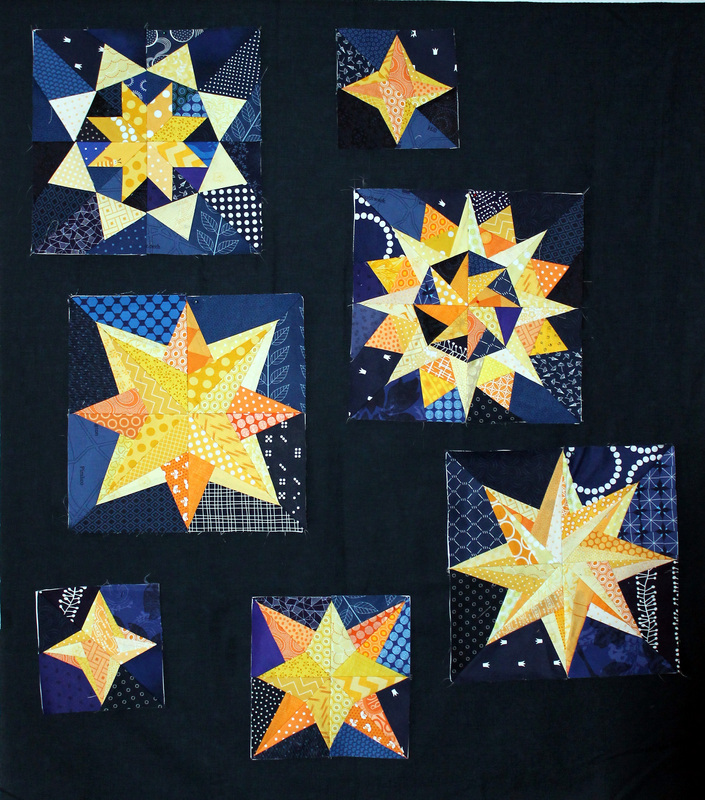 This week I decided to play a little with my Starry Night blocks, that is put them up on the design wall and see how it was all coming together. But before I started “playing” I made this block…. Yes, another pattern from Quilting on the Square’s free Bonus Compass blocks… this time I went with their twinkle pattern. A lovely little pattern taking just 32 pieces. As I started pinning the blocks up on my design wall I quickly realised I needed some more variety in sizes for my stars… so just for fun I made this “little” variation on my twinkle block. 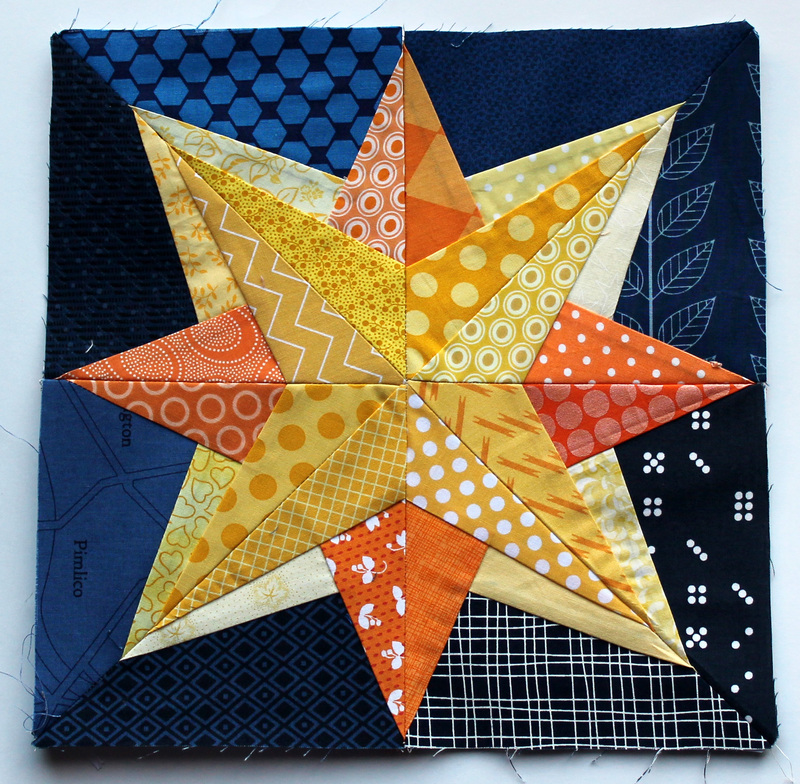 This mini twinkle star uses Quilters Cache’s free eight pointed star pattern. I printed this pattern out at a smaller size than the pattern dictates and as I am not worried about being too accurate with the star sizes I let my printer do the re-sizing calculations. 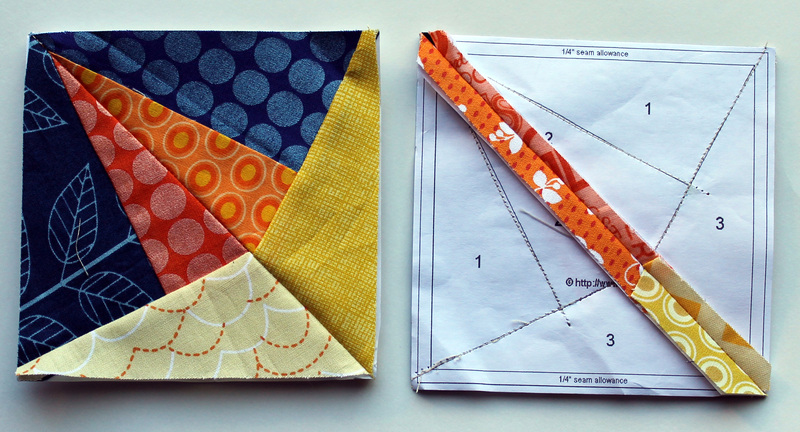 When I was finished with both these blocks, I tacked them up on my wall…. now this is really just a very very rough work in progress, just so I could see how the blocks looked together and so I could work out what I needed to be doing with my patterns going forward. I have a way to go… but I think it is coming together nicely. I have worked out that I want more variety in my stars and more variety in my sizes. Looks wonderful! I love the colors you chose and the stars are all coming out great. So gorgeous, can’t wait to see the finished quilt! These are so beautiful. I’ve never worked with blocks that are different sizes and am curious to see how you reconcile them. I am curious how it is going to work too LOL. I will keep you posted. I am in love with these! The Starry Night is one of my favourite paintings and you are capturing it with those colours and those stars! Inspiring! These are gorgeous! I love your choice of fabrics! This is so lovely! The background fabrics are wonderful for your Starry Night! These are so lovely! 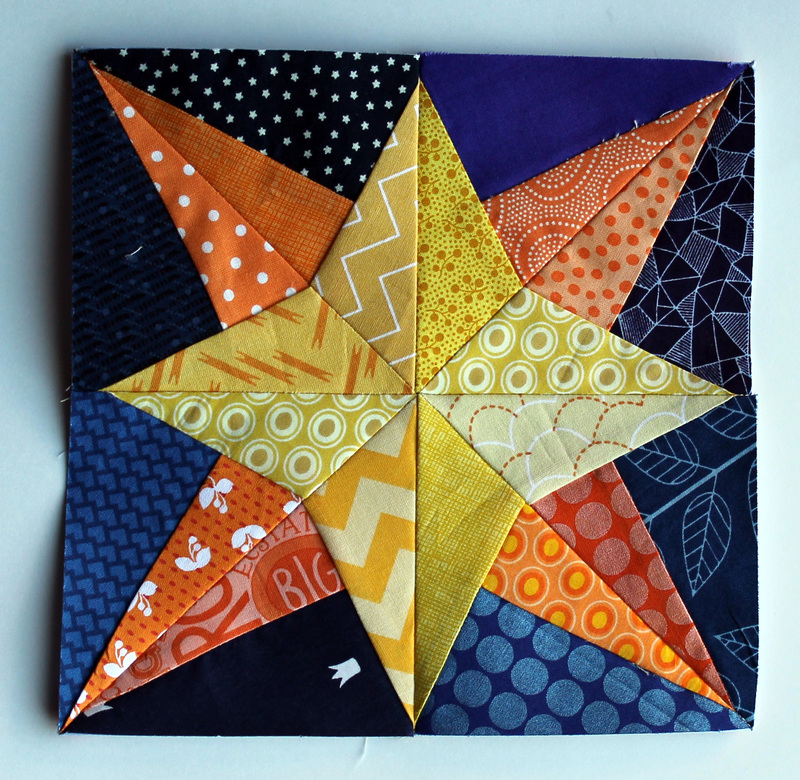 Part of me is envious of the way your blocks are turning out and how amazing your quilt will surely be…another part of me can’t imagine spending any more time than I already have on the quilt top and I’m glad I did something simple for the stars! So I think I will just admire yours and live vicariously through your gorgeous stars! I had to double take when I saw this comment. Your quilt, which inspired this crazy starry night journey for me, is amazing and there is sooo much work in it… and I will not even mention the amount of amazing work that went into the Tardis quilt! BTWI love your simple stars, and there will be a few of those on this quilt, just as a homage. I loove this quilt design. It is really enjoyable to see it come together. And the colors are so great! Using different sized blocks really adds a lot of motion to this quilt. I can’t wait to see what you do next! This is looking absolutely gorgeous. It’s going to be stellar! (Excuse me, I couldn’t resist the pun…) I think you’re absolutely right about varying the sizes, it makes it much more interesting. This quilt is going to be “over the moon” — hehehhe. 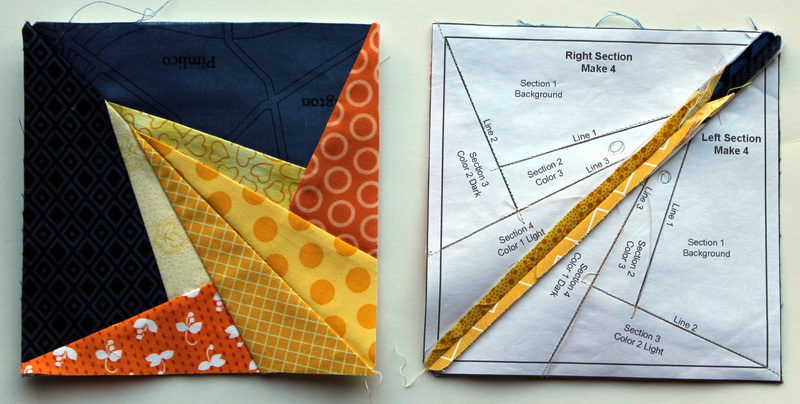 Love the different sizes; you are definitely on the right track with this quilt. Bravo! Stars are just wonderful aren’t they? This is going to look stunningly beautiful when you are done. This is going to be so amazing. I love what you have done so far! Keep on going! I love how you say ‘just 32 pieces’. I actually had a dream about paper piecing last night, but it was probably more like a nightmare. You do beautiful work! I am really hoping it was not a nightmare…though I do believe I have had a few piecing nightmares myself, all involving wonky seams. I love them all!! Can’t wait to see how you put it all together! You are definitely capturing the title of your quilt. Varying the block size is going to look great. Really beautiful. I love your fabric choices and the variation in the blocks. Looking forward to seeing this come together. Gorgeous, just gorgeous! It’s going to be an absolutely amazing quilt! I am so terribly excited to see this come together! I am already happy for you because it is going to be a creative masterpiece! Are you staying with all yellow/orange toned stars? I am going to try and stay in the yellow orange range. I may throw in a piece of red here and there.